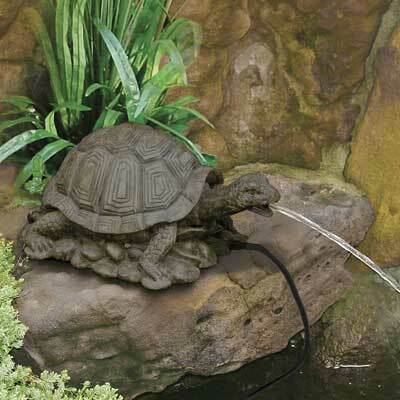 Add fantastic, lifelike sculpture and lovely, cascading water to your pond with this Beckett Turtle Pond Spitter. This adorable, resin figure perfectly showcases your love of aquatic wildlife, while also bringing the look and sound of moving water to the area. The easily recognizable turtle figure rests atop a pile of faux rocks, with each foot reaching outward as if to grip the terrain. The extended neck and lifted head add a bit of personality to the turtle, and its olive and gray hues enhance your natural setting. A barbed adapter sits at the base of the statue, and easily accepts 3/8" or 1/2" inner diameter tubing (not included). Connect a pump (not included) to this tubing and watch water exit through the turtle's mouth, for a fun bit of movement and aeration. Crafted from resin, this figure remains hardy when left outdoors through the warm seasons, and the flat base makes resting it on a level surface near your pond simple. Enhance your garden with a bit of moving water and unique style using this Turtle Pond Spitter.